Kohler Santa Rosa Toilet Review - Is It The Best One Piece Toilet? When choosing a brand new toilet you have to consider not only features and performance but also design. You will hopefully be using this toilet for many years to come, so you better make sure you like the look of it. The look and style of the toilet you buy will be a personal decision. Hopefully, this Kohler Santa Rosa toilet review will help you decide whether this toilet is the one for you. Lets have a closer look at this model to see if it is worth considering. The Kohler Santa Rosa K-3810 is a one-piece toilet. As I said earlier, when choosing the look of a toilet it is a personal choice. Whether you like a one-piece or a two-piece toilet is up to you but there are a couple of things to consider when deciding. First of all, one-piece toilets are usually more expensive than two-piece toilets. Secondly, if you are going to install the toilet yourself, you will be lifting the full toilet, rather than installing the bowl first and then connecting the tank separately. Make sure you will have the strength to do this as you don’t want to pop out your back. Thirdly, a one-piece toilet is a lot easier to clean and maintain, compared to a two-piece. A two-piece has a crevice between the tank and bowl, no matter how well it is connected. This crevice will accumulate bacteria and mold over time, so it will need extra maintenance to keep clean and hygienic. Finally, a two-piece can have leaking issues, however this problem is rare these days because of improved technology. One piece toilets are more expensive, heavier to install but easier to clean. This unit has an elongated shape. Elongated toilet bowls are around two inches longer than a standard bowl, making it more comfortable to use for large people. It will also take up a little more space, so not ideal for tiny bathrooms. The Santa Rosa is also a Comfort Height toilet. A Comfort Height toilet is ADA Compliant, so it is suitable for a wide range of users. A Comfort Height seat is around two inches taller (from floor to seat) than a standard toilet and is similar to the height of a regular chair. This will benefit people that find it difficult to stand up and sit down. A comfort height toilet is great for the elderly, the disabled and people recovering from knee or hip surgery. 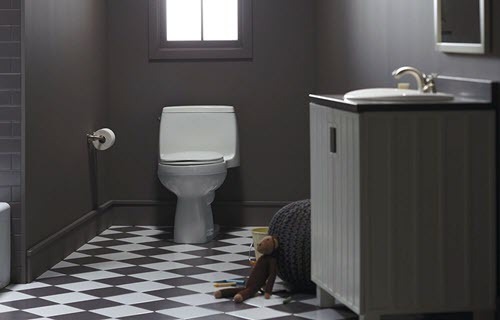 The Kohler Santa Rosa is a Comfort Height, ADA Compliant toilet. 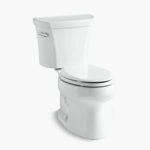 Overall, the Kohler Santa Rosa is a great looking one-piece toilet, with smooth lines. If you like the look of this toilet, lets have a closer look at its performance. Using an AquaPiston Canister and gravity force, this powerful toilet flushes water 360° into the bowl. This means that every section of the bowl will be thoroughly cleaned. This canister provides a leak-free performance because it has 90% less exposed seal material compared to a regular 3″ flapper. The flush is not only powerful but efficient as well. The toilet is WaterSense Certified and only uses 1.28 gallons per flush. Many modern toilets use 1.6 GPF, however this model uses 20 % less water. If you are upgrading from an older toilet that uses 3.5 GPF, you will save up to 16,500 gallons of water per year and you won’t sacrifice on the flush power either. It will just be a more powerful and highly efficient toilet. Great for the environment and great for water bill savings. As with all modern toilets, installing a new toilet is not as difficult as you would imagine. And this toilet is no different. If you would like to install this toilet yourself, then give it a try. You won’t need any real DIY expertise, other than a look at an installation video. The only issue I have with installing this toilet is that it is quite heavy. It is a one-piece toilet so you will have to lift it all in one go. A two-piece toilet is a little easier to install because you can connect the two parts separately. However, it you have the strength to lift this model, then installation should be relatively easy. To find a suitable competitor to compare the Kohler Santa Rosa to, it was important to compare like for like. Therefore, I searched for a leading brand, one-piece toilet with similar features and performance. The toilet I found is the TOTO Ultramax II. When it comes to looks, my first impression is that they both have a similar design. Very smooth lines, stylish and neat. Nothing very distinctive, simple but modern. With further inspection, the Santa Rosa tank does look wider compared to the Ultramax II. Both toilets are ADA Compliant and with seat will be over 17″ in height. Kohler has their patented Comfort Height, where as TOTO has its patented Universal Height. Both very similar so far. Both toilets are one piece, elongated and ADA Compliant. The TOTO Ultramax II uses its Tornado Flush System to provide a very powerful flush. The Santa Rosa uses Kohlers AquaPiston flush technology to also have a powerful and efficient flush. Both toilets are WaterSense Certified as they only use 1.28 gallons of water per flush. Both toilets are WaterSense Certified, using 1.28 GPF. They are of similar price (Ultramax II was a little more expensive at the time of writing) and both have a toilet seat and lid included. However, it appears that Kohler customers were not satisfied with the toilet seat included. It was a pretty basic seat and many wanted to replace it for a slow close lid. The Ultramax II also had a seat included, however this one was better quality and slow close. The Kohler Santa Rosa is a little bit cheaper. Overall, both of these toilets are a great option. They are WaterSense Certified, ADA Compliant, have a powerful and very efficient flush. They are also one piece toilets of similar price. It is hard to choose one, however I will choose the Ultramax II for two reasons. One reason is that TOTO provides a better quality slow close seat and lid. Even though this is probably offset by its more expensive price tag, at least you won’t want to replace the toilet seat the day after you purchase the toilet. It is not a cheap toilet so it should not have a cheap toilet seat. The other reason I choose the Ultramax II is that it appears to be highly rated on Amazon. It has more reviews from satisfied customers. Both have similar ratings though. If you would like to see a more detailed review of the TOTO Ultramax II toilet, then follow the link. The Kohler Santa Rosa is a sleek one piece toilet. It has a powerful, efficient flush, using only 1.28 gallons per flush. It has Comfort Height seating, making it suitable for a wide range of users. 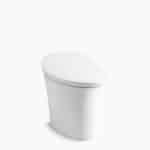 The Santa Rosa is a toilet that will add a contemporary style to any bathroom. Overall, if you are in the market for a modern, stylish one-piece toilet then the Kohler Santa Rosa may be a good option for you. It not only looks great but is powerful and efficient too. Its WaterSense Certification will save you money on water bills and its Comfort Height seating will provide a more comfortable seating experience for more users. The Santa Rosa is certainly a good quality toilet. I hope you found this Kohler Santa Rosa toilet review helpful, and are able to make a better decision on whether this toilet is right for you. If you have any more questions on this model, please leave a message in the comment section below.